Seven Seas Entertainment, 9781935934776, 320pp. 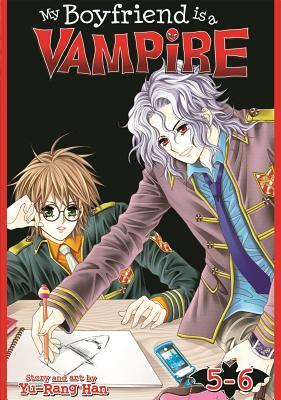 "My Boyfriend is a Vampire "is an all new shoujo comedy series in the vein of "Vampire Knight," presented in two-volumes-in-one omnibus format. Seven Seas will release the entire angsty series across seven low-priced omnibus editions. Being beautiful is never easy, especially if you're an eighteen year old boy like Ryu who is constantly mistaken for a girl because of his delicate good looks. Ryu is, in fact, anything but delicate. He is the ringleader of a group of tough kids in an all boy's school, and he's quick to beat the living daylights out of anyone who even hints that he resembles a girl. If that wasn't hard enough for a regular teenage guy to cope with, his life is about to take a shocking turn for the worse. When Ryu stumbles upon strange happenings in the forest, he gets sucked into a world of vampire intrigue and sinister romance that he never knew existed. And he learns that there are worse things than being turned into a vampire: being turned into a girl? Han Yu-Rang, the author/artist of My Boyfriend is a Vampire, is a prolific Korean comics creator whose works focus on shoujo themes.